Bo Lindberg. William Blake’s Illustrations to the Book of Job. Ph.D. thesis, published in 1973 in the Acta Academiae Aboensis. Reviewed by G. E. Bentley, Jr.*↤ G.E. Bentley, Jr. (University of Toronto) is editor of Vala (1963), Tiriel (1967), and The Writings of William Blake (in the press); and author of Blake Records (1969), The Blake Collection of Mrs. Landon K. Thorne (1971), and, with M.K. Nurmi, of A Blake Bibliography (1964) (a revised edition by GEB is in the Clarendon Press). Blake’s engraved illustrations to Job (1826) are probably his best known series of designs, and there have been many books dealing wholly or significantly with Job, notably by Norton (1875), Binyon (1905), Wickstead (1910, 1924), Russell (1912), Damon (1924, 1966), Binyon & Keynes (1935), Hofer (1937), Hamblen (?1939), Patchen (1947), Lande (1948), and Wright (1972). The subject, therefore, is not novel, and to undertake a doctoral study of it at this date is an act of formidable temerity, an act which Mr. Lindberg has triumphantly justified. The most important part of the dissertation is the catalogue (pp. 183-352), which includes not only the conventional descriptions, provenances, size, collection, etc., but also elaborate and extremely persuasive studies of the sources and meaning of each drawing or print. This catalogue raisonné of Blake’s Job designs will for very long remain the standard work on the subject. Chapter I, on the chronology of the Job designs, is useful but somewhat abstract and tabular in form, with summaries of relevant documents. I think it might most usefully appear as an appendix. Chapter II, with the Introduction and Synopsis of Job, serves its purpose very well, but I think it should be the first chapter. Chapter III, about Blake’s drawing, painting, and engraving techniques, and his use of The Testament of Job, is novel and extremely useful. In particular, the account of Blake’s use of the visual tradition of Job illustration is highly original, persuasive, and important. Chapter IV, “Blake’s Visions and the Job,” is very brief (pp. 151-66) and, dealing as it does with Blake as a mystic, is interesting and plausible but not, I think, especially relevant to this work. Perhaps it belongs in an appendix. Chapter V, on technique again, is original and penetrating, but the matter seems to overlap with that in Chapter III and might well have been included there. In terms of originality, the book is important primarily in six ways: (1) Mr. Lindberg looks at Blake’s Job with the eyes of an artist and an art historian, not as a literary critic (the mode adopted by almost all his predecessors)—I believe it may be said that Mr. Lindberg is the first to see Blake’s Job truly and see it whole; (2) The treatment is very systematic, and, with such a very large bulk of material, and an artist as unconventional and irregular as Blake, this is of the first importance, though Mr. Lindberg’s predecessors have rarely been able to see, or cope with, its importance; (3) The dating of the Butts watercolors in 1810 and the well-founded dismissal of the New Zealand set from the Blake canon are original and important; (4) The dating of the first separate Job sketches and engravings in 1793 is very welcome; (5) The elaborate study of sources, and the conclusion that Blake’s Job is entirely traditional, are important and reliable; and (6) The analysis of Blake’s designs of “The Spiritual Form of Pitt,” of “Nelson,” and of “Napoleon” (with a visual recreation of the last, lost, drawing), which contradicts, I believe, every previous discussion of these works, seems persuasive to me, and will prove the nucleus for future discussions of these important Blake works. The book is thus much more than a study of the Job series of engravings of 1825; it is a systematic analysis of allusions to the Biblical Job in all Blake’s writings and drawings. 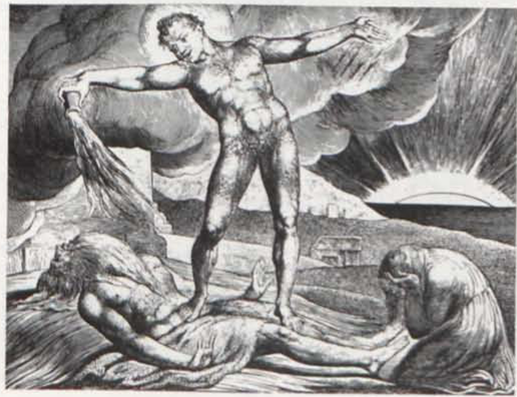 In future, scholars concerned with any aspect of Blake’s treatment of Job, indeed scholars dealing with iconography of Job after 1700, should consult, understand, depend upon, and be grateful to, Mr. Lindberg’s[e] study of William Blake’s Illustrations to the Book of Job. The book would have been significantly improved by the addition of a few small details. It needs a Table of Abbreviations, for a number of the abbreviations are distinctly unfamiliar to literary scholars. The sources of the photographs should be given, and the locations of the originals reproduced (e.g., Jerusalem) should regularly be identified. The captions to the illustrations should have cross-references to the text. It would be useful to have, in one place, a survey of Blake scholarship concerning Job. The difficulties of printing a book with a printer whose language is not that of the text are notorious, and in general Mr. Lindberg has overcome them heroically. It yet needed to be proofread thoroughly and effectively once more. For a book of the distinction of this one, there are considerably too many defects of a mechanical kind, particularly of spelling, punctuation and diction, but also of capitalization, and agreement of subject and verb. (Per contra, I should remark that the English is often remarkably eloquent and effective, not mere run-of-the-mill scholarly writing.) The bibliography (pp. 353-62) and the bibliographical details elsewhere are often surprisingly irregular. There is no such book as “Keynes, George Cumberland, 1970” (pp. 44, 357), for example, and John Flaxman’s Lectures were not published in “1792” (pp. 290, 311). There are as well a few minor omissions, such as Robert Essick’s Finding List of Blake’s designs in the Blake Newsletter, Janet Warner’s essays on Blake’s pathos-formulae published recently, and the 1971 edition of Keynes’s Blake Studies. The facts given are on the whole remarkably reliable, but a few are suspect, for example, that Westall “knew Blake personally” (p. 327) or that proofs of Job are in the “National Gallery of Art, Washington” (p. 30)—they are in the National Gallery, but the location is Jenkintown, Pennsylvania. Often it is not easy to ascertain with confidence whether Mr. Lindberg has seen the original of the design he is describing or only a photograph, and occasionally he confidently describes what can only be an inference—for example that a bag in a girl’s hand contains jewels (p. 334); this last is the kind of fault for which Mr. Lindberg justly and acerbically criticizes his predecessors and which is very rare here. Beside these petty faults, the merits of the book are major and extensive. It is methodical and comprehensive, meticulously accurate, and consistently persuasive. Mr. Lindberg describes the Job with the eyes of an artist and of an art historian, in sharp and vital contrast to most of his predecessors. The study of the sources of Blake’s Job, particularly of The Testament of Job, is excellent and of very great importance; indeed, I think it is safe to say that most of these sources have not been related to Blake’s work before and that it is impossible to understand Blake’s Job adequately without them. The interpretation of each design is elaborate and in almost every case convincing; the dating of a number of the earlier drawings is new and well-argued; and the analyses of “Pitt” and “Nelson” are both highly original and highly commonsensical. In summary, I conclude that Mr. Bo Lindberg’s dissertation on William Blake’s Illustrations to the Book of Job is the best dissertation I have ever examined, one of the two or three best I have ever read, and one of the half dozen most important books on Blake’s art. Every responsible Blake scholar must read it. It is a work of the highest distinction. We are all indebted to Mr. Bo Lindberg.